Born on March 16, 1924. Father - Antons Matusevichs was a good blacksmith, he received orders and made products for sale at Israelite iron works store in Rezekne, Latgales street. Mother - Anna Matusevicha (1885 - 1960) was a housewife. Brother Joseph (1910 - 1941) learned his dad's trade and became blacksmith. In 1939 he started working as a truck driver in the Rezekne forestry. In the beginning of WW2, when Rezekne was occupied by German army he was mobilized as a driver, to evacuate Rezekne militia to Soviet Union. By a direct hit, he died near Golisheva not far from border with Latvia. Brother - Janis (1906 - 1973) was also a blacksmith, lived at family home. He was freed from mobilization. Heroic act of Matusevichs family. When shooting of Jews started in Rezekne, one night the Matusevichs received uninvited guests: Chaim Israelite with his 13 year old nephew Yakov Israelite. When their family had been taken away, they both hid in a house cellar. They begged for refuge. Matusevichs family: Anna with a daughter Yadviga and son Janis took the big responsibility and hid them at their old house and kept them there for almost three years until Germans were kicked out from the area. During the war Yadviga worked in the army's economy shop as a saleswoman and sometimes she managed to get a bigger portion of food. They had to maintain great circumspection while caring for Jews, because in the new house where the Matusevichs stayed some German officer was housed. This only made it harder for the family to hide the Israelites till July 27, 1944. After the WW2 Chaim Israelite lived in Rezekne, he died in 1964, and was buried at the Hebrew cemetery in Rezekne. Yakov Israelite, who was born in 1928 finished naval college of Riga, worked in textile industry in Riga as a foreman, and in 1990 moved to Israel. 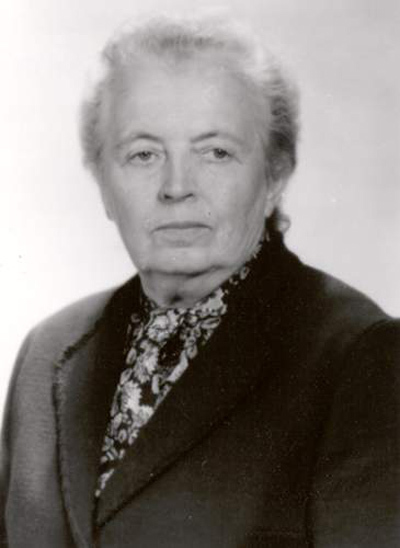 On October 23, 1989, Yadviga Arcihovska (maiden name Matusevich) received the biggest award for outstanding bravery and a human act during WW2: honorary title "Righteous among nations" with rights to receive the Honor medal and a tree was planted in a memorial in the "Yad Vashem Righteous garden" in Jerusalem. On June 13, 1993 Y. Arcihovska received the Memorial medal from the Chief Council of Republic of Latvia. Y. Arcihovska lives in Rezekne. On July 4, 2000 Yadviga Arcihovska received Three Star order. This is an article appearing on the FIEL - Foundation for Informative Education in Latgale. Click here to read the account of this hero at the Yad Vashem website.